Traditional shepherds (also cottage) pie originated from frugality, a way of making the traditional Sunday roast go further. Leftover meat was stripped from the bones, bound with vegetables and gravy and then topped with mashed potatoes. It’s easy to see the relationship between this dish and many other British classics such as Lancashire hotpot and Scouse. All use potatoes as cheap bulking to make the meat go further. Today shepherds pie is used to denote the meat contained (Lamb.) 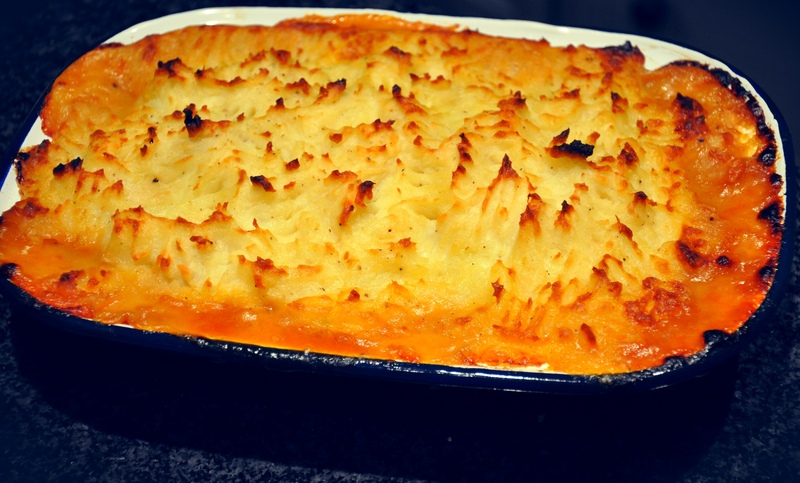 Historically cottage pie is mentioned much earlier (1791) than shepherds pie and was used as a generic term for an affordable meal for the workers who usually lived in cottages. It did not specify the meat but aways had a topping of potatoes. Most shepherds pies nowadays use minced lamb as the meat. For the ultimate, and in keeping with tradition of using the roast leftovers, I am using lamb shoulder and roasting it before making the pie. Apart from providing nice, melt in the mouth chunks of meat, roasting a whole joint gives you bones, and lovely caremalised juices at the bottom of the pan. This will make the best stock. As is the case for all cooking, the better to stock the better the meal. What else goes into the pie filling? Some recipes include tomatoes, but this is not Bolognese topped with mash. Tomatoes would not have been available in the UK when this dish emerged and so I am leaving them out. Carrots, Onions, Celery all make it in to the recipe, all are classic british stock veg. I also like to add a few mushrooms. You can add more or less as you like and my below recipe is only a guide, add what you like, leave out what you dont. In terms of other flavourings it’s really up to you, Worcestershire sauce is a must as far as I am concerned, the slightly spiced back-note really adds depth. Herbs are a matter of preference, I use a sprig or two of rosemary during cooking and then remove but you could add mint or any herb that pares well with lamb. butter, milk and a little grated cheese. Season the lamb shoulder and roast in a low oven for 4 to 5 hours, I would suggest doing this the day before you want to make the shepherd’s pie so you have time to make the stock etc. The meat should be falling off the bone. Pull the meat from the bone and leave to one side. Deglaze the roasting pan and add the liquor to a large pot with the bones, a bay leaf and some stock veg (onions carrots etc). Simmer for a couple of hours until nicely reduced. Sweat the onion, carrots and celery in a little oil for 10 minutes until softened and slightly browned. Add the sliced mushrooms and continue to cook for a couple of minutes. Add the reduced stock, the lamb pieces, the herbs and sauces. Simmer for 20 minutes then allow to cool slightly. I’m not going to insult your intelligence here, I am sure you all know how to boil and mash potatoes. With the pie filling now warm, but not hot. Carefully spoon the mixture into a sieve and allow some of the liquor to drain into another bowl or pan before transferring the meat and vegetable mix to a suitable oven proof dish. The reason I strain off some of the liquid is it makes it easier to spread the mash on top. The pie will not be dry but not as slushy as some. I serve this liquid on the side, it’s an excellent gravy. Spoon the mash on top and spread evenly, use a fork to rough the top up, this creates lovely crispy bits. Grate a little extra cheese on top or drizzle with a little melted butter. At this point you can freeze the pie. It’s a good idea to make more than you need and freeze some for another time. If cooking straight away bake at 180 degrees for 35-40 mins until crispy on the top. If cooking from cold (or defrosted) add another 20 mins but drop the heat to 160. Serve with green vegetables of you choice, and of course the reserved gravy on the side. I cooked this a couple of weeks ago. Just typing this up is making me hungry, good job I got one out of the freezer last night. Mmmmm this sounds and looks so good, just a shame I’m vegetarian heh? !